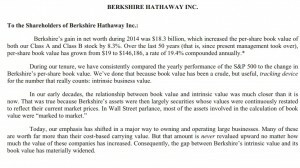 Saturday, Feb. 28, 2015, Berkshire Hathaway posted their 2014 Berkshire Hathaway annual letter. As this is the 50th anniversary of Warren Buffett taking control of Berkshire, this letter included two extra sections. Both Buffett and Vice Chairman Charlie Munger wrote about their observations about the first fifty years of Berkshire Hathaway and what each expects in the next fifty years. I have come to think of the Berkshire Hathaway strategy as an “open source” strategy — they provide an open book about their strategy and are willing to share it with anyone who will listen. It remains a mystery why more people do not attempt the strategy because it is there for anyone to use: it does not require particular intelligence, and is not particularly difficult to accomplish pieces of the puzzle. The probable answer is that it is unconventional (better to fail conventionally than succeed unconventionally? ), and it takes time to get the various components put together properly. Thus, the results do not appear quickly and it is difficult to have the patience for the strategy, even though compounding means the results compound immensely later on. Nonetheless, I am happy to say that I am on track building a strategy based on the “open source” components of Berkshire Hathaway at my investment fund, Greybull Stewardship. I am forever grateful to Berkshire for being such an open book, and I am doing my best to use the source code wisely. Here are some of the observations from Buffett and Munger about what made and makes their strategy work. Efficient allocation of capital among portfolio companies. This is the first thing that he writes showing why the Berkshire structure and strategy are so attractive. Buffett writes, “we can — without incurring taxes or much in the way of other costs — move huge sums from businesses that have limited opportunities for incremental investment to other sectors with greater promise.” This sounds simple, but most other investment structures cannot do this or it is very difficult. Traditional private equity funds cannot usually do this. Deal-by-deal investment strategies cannot do this. Buffett even writes of the difficulty that tax-exempt investors such as pension funds have in accomplishing this. At my Greybull Stewardship, we also have this advantage. We use flow-through tax structures and are commonly harvesting capital from some businesses, investing deeply in other businesses, and moving capital efficiently to the best opportunities. Wide ranges of Opportunities. Berkshire also has the ability to invest in a wide variety of things. This provides a proper “opportunity cost” perspective about what is the best allocation of capital at any point in time. At Greybull Stewardship, we have a little of this. We use an “opportunity cost” way of thinking more than most because we have a broad range of choices to reinvest into our existing portfolio or buy new companies. However, we traditionally do not invest in public companies. Perfect home of choice for certain business owners. For owners who do not want to sell to a competitor nor sell to a private equity fund that will flip ownership of the company in a few short years, Berkshire is the perfect choice. As Buffett writes, “Some sellers don’t care about these matters. But, when sellers do, Berkshire does not have a lot of competition.” This factor is huge — many short-term fund investors greatly underestimate this. At Greybull Stewardship, we also have this advantage. We use an evergreen fund structure that allows us to hold businesses as long as we want, and it provides the management teams maximum flexibility to pursue strategies that make sense for their business. We strive to provide a perfect home for the life-long work of business owners and management teams. Continuous maximization. Munger makes the point that Buffett has invested using this structure for 50 years, and was very good at focusing on a few things such as capital allocation and constantly learning in order to continually improve. At shareholder meetings, I have heard Munger refer to Buffett as “a learning machine.” He also makes the point that the portfolio companies also have this advantage because their CEO’s are in place for a long time and are free of many distractions because of Berkshire’s ownership. Gained loyalty by giving loyalty. Munger often describes Berkshire as having a “seamless web of trust” in the way they trust their portfolio companies. Munger observes that Buffett constantly searches for win/win scenarios and gains loyalty by giving it. At Greybull Stewardship, we also have this advantage. We are pursuing the effective decentralization strategy as described so well in the book The Outsiders by Will Thorndike. Berkshire Hathaway is a great example of this strategy. Avoiding bureaucracy. Both Buffett and Munger mention how staying lean at the corporate level was key to the strategy. They did not impose work on the portfolio companies by having departments and bureaucracies at the corporate level. At Greybull Stewardship, we also have this advantage. We have chosen our partners to be the management teams at the portfolio companies. We give them tremendous decision-making responsibility and they are doing a marvelous job. Tax Advantage of Long Term Holds. Although he does not mention it in this letter, Munger has frequently spoken about the small “one or two point per annum” tax advantage that accrues by holding investments for the very long term. At Greybull Stewardship, we also have this advantage. We have the flexibility to hold investments and let the value compound. I plan to write a bit more about this advantage on financial returns in a later post. In the end, the list was pretty simple, which is also makes it so interesting. There is no rocket science to it. That does not mean it is easy, but the strategy is available to those who can be learning machines.